Jeffrey Court’s glass mosaic tiles make a great complement to a wide variety of decorative styles and add a level of design sophistication to any room. Glass mosaic tiles are great by themselves or can be installed alongside stone or ceramic field tiles (sold separately) to create a coordinated look. Mesh-mounted glass mosaic tiles are easier to install than traditional tile formats and can be used as whole sheets or cut to make inexpensive feature strips. 1 square foot per piece, each piece sold individually. Piece weight equals 2.98 lbs. Buy online Jeffrey Court Prezzano 12 in. x 12 in. 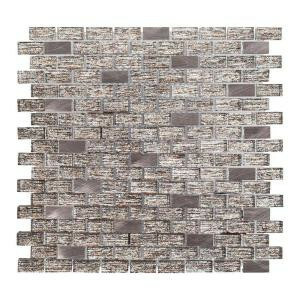 x 8 mm Glass Mosaic Tile 99325, leave review and share Your friends.